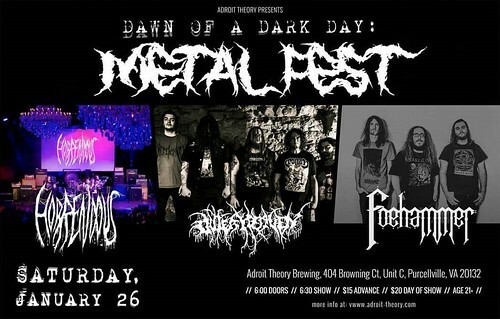 Adroit Theory brewery in Purcellville, Virginia, is hosting their first metal show ever on Saturday, January 26th! Pennsylvania based death metal band Horrendous is one of the hottest underground metal bands around right now and they’re set to headline this first metal show at Adroit Theory with support from Outer Heaven and Foehammer. And because we’re so excited about this show DCHM is going to give away a pair of tickets to one of you lucky DCHM readers! To enter: just leave a comment on this post telling me your favorite metal album of all time. Then at 5pm EST this Tuesday, January 22nd, a winner will be chosen at random (using Random.org) from all valid entries to win the tickets to this show. Be sure to use a valid email you check regularly so I can contact you if you win. Don’t worry, I won’t add you to any spam lists or sell your info or anything sleazy like that. If I haven’t heard back from the winner in 24 hours another winner will be chosen at random. If you can’t wait to see if you win or the contest is already over when you read this, then you can get tickets here. Horrendous released their debut album, The Chills in 2012 to much fanfare in the underground but their 2014 album, Ecdysis, was their true breakout. It was reviewed very highly in many metal publications and by fans alike and the band started showing up on tours with some big names. In September 2018 they released another modern classic of riff based death metal when Idol showed that this band can still bring the riffs along with the super fun live show they’ve been perfecting from heavy touring. Support band Outer Heaven is also a death metal band from Pennsylvania and they’ve been gaining popularity for putting on some truly brutal shows around the region. Their 2018 full length Realms of Eternal Decay is a pummeling album of demonic death metal. 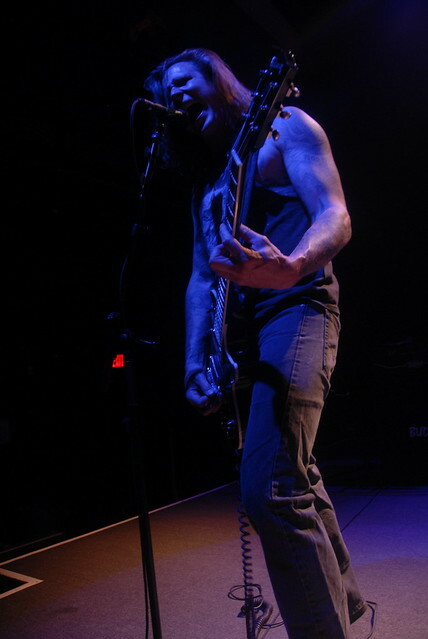 The opening band, Foehammer, is a Northern Virginia based doom metal band that is very slow, very loud and ultra heavy! Their slow, churning riffs carry the weight of oceans and drown the listener in their fuzzy wall of sound. Now leave a comment telling me what your favorite metal album of all time is and check out videos of the bands playing Adroit Theory’s first ever metal show below! 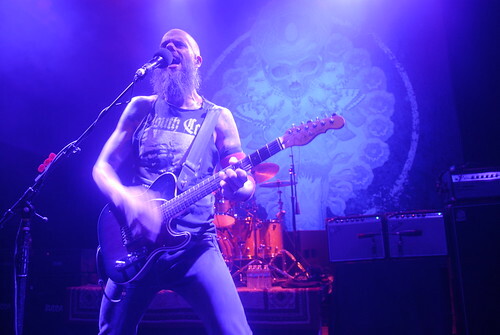 I don’t usually cover things outside of the DC area but I’ll make an exception for the Decibel Metal & Beer Fest held at the Fillmore Philadelphia on April 22nd and 23rd. 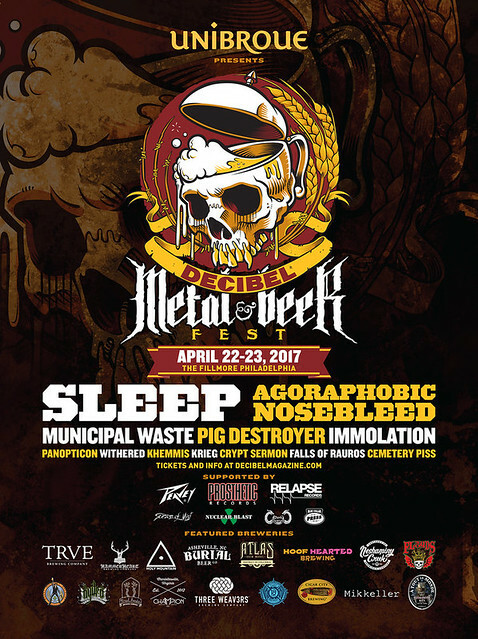 Metal and beer are two of my favorite things and Decibel did a great job of bringing together some excellent bands along with some quality breweries with heavy metal ties for a weekend that was pretty damn fun overall. I’ve been a rather sick since the fest so I’m behind on getting this post up, but there was some cool stuff going on at this fest that I wanted to make sure got covered here even if it is going up a bit late. I’d never been to the Fillmore in Philadelphia before but I quickly realized that it is much larger than our Fillmore in Silver Spring, maybe about double the size. The doors opened at 5pm each day and bands were still setting up their merch booths as the doors opened. Things were a little disorganized, but considering this was the first fest of its kind it wasn’t that bad. 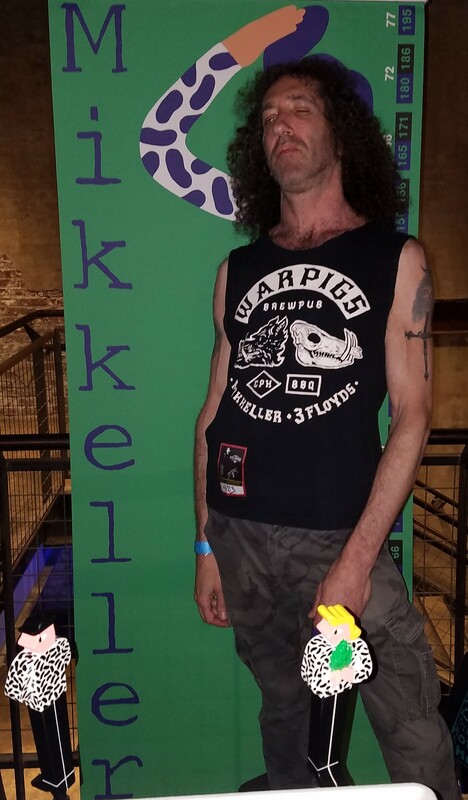 One of Mikkeller‘s beers didn’t show up until the second day and the venue ran out of the small plastic beer sampling glasses rather quickly on the first day which lead to most people getting cups from the bar. Overall those weren’t major issues though and it was a lot of fun talking to the people that work for the various breweries about their beer and metal bands they are into. There were 17 breweries at the festival and each had a booth with at least two beers being poured. The booths were mostly on the ground floor lining the walls in the main concert room, however there were 4 upstairs and 3 in the main entry room, including the massive Unibroue booth. Along with the band merch and beer booths there were a few other merch vendors in the main entry room. Despite being in Philly, between all my beer friends and metal friends I felt like I kept running into someone whichever way I turned all weekend. The festival did a really good job of actually blending a metal fest with a beer fest. This wasn’t just a metal show with some beer vendors, or a beer fest with some metal bands playing. Decibel managed to bring together metal bands with ties to craft beer with breweries with ties to heavy metal. Burnt Hickory had a beer tap that looked like an Orange amp rig. Trve Brewing and Hammerheart Brewing both had brewers in bands that performed at the fest (Khemmis and Panopticon, respectively). 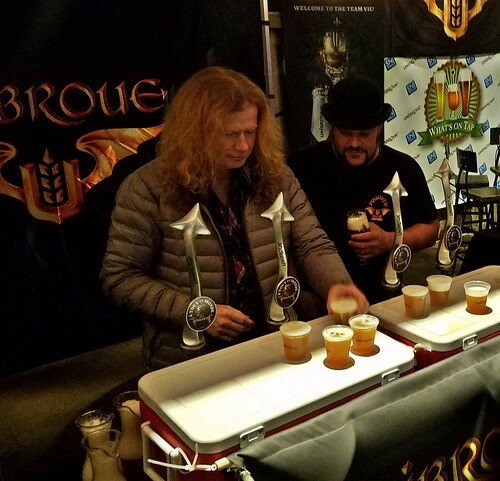 Dave Mustaine was there on Saturday to pour samples of the Megadeth beer A Tout Le Monde at the Unibroue booth, he was certainly getting A-list celebrity treatment. I found Dan Lilker (of Anthrax, Nuclear Assault, and a ton of other bands over the years) pouring beer at the Mikkeller booth and taking photos with any fans that wanted one. I talked to him a bit and it turns out he’s really into craft beer and even knows some of the guys at the Danish brewery Mikkeller, which is how he ended up manning their booth. At one point I saw Municipal Waste drummer and craft beer connoisseur Dave Witte at the Cigar City Brewing booth, where the Municipal Waste beer Divine Blasphemer was being poured. And Richard Christy (of Death, Iced Earth and also the Howard Stern Show) was seen sipping the Charred Walls Of The Damned beer from Burnt Hickory. And let’s not forget about the awesome bands! There was a wide range of metal in the line up. Grindcore, stoner, thrash, death metal, black metal, doom, the focus was certainly on the more underground sub genres. On the first day of the festival I was most excited to see Panopticon. Austin Lunn is the mastermind behind Panopticon and also a brewer at Hammerheart Brewing in Minnesota. 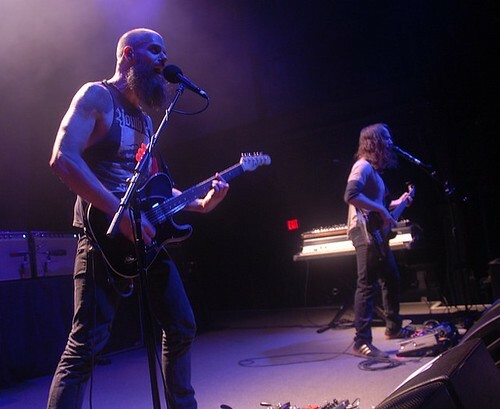 Despite forming about 10 years ago, the band has only recently starting performing live. Their first live show ever was last summer at Migration Fest. This is because Panopticon is a one man band in studio and Austin gets other people to fill out the band for live shows. 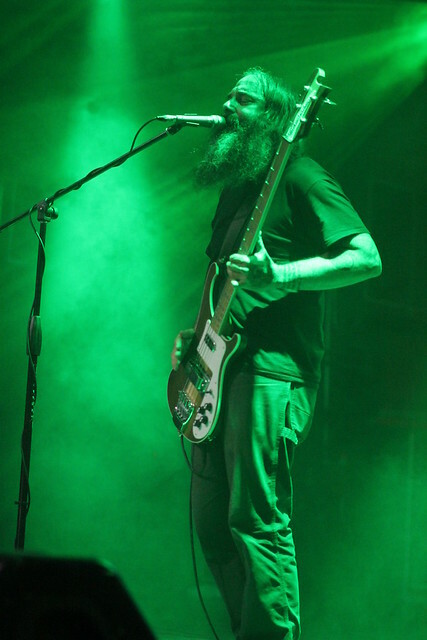 Panopticon is known for mixing black metal with Appalachian folk to create a truly unique sound, sometimes called “blackgrass” as a hybrid between bluegrass and black metal. Unfortunately they didn’t use a banjo live, and their mix wasn’t always great, but it was still pretty awesome getting to see Panopticon live as they have some very powerful and moving songs. I also found Austin’s Hammerheart brewery to be one of my favorites at the fest. They specialize in smoked beer (which is a personal favorite style of mine) and their rauchbier was my favorite beer of the entire fest. Apparently Austin apprenticed at a brewery in Norway for a while and upon returning to the US he moved from Kentucky to Minnesota to start Hammerheart Brewing. The brewery’s name is no coincidence, it is in fact named after the 1993 Bathory album. Panopticon performing their song Black Soot And Red Blood at the Decibel Metal & Beer Fest! 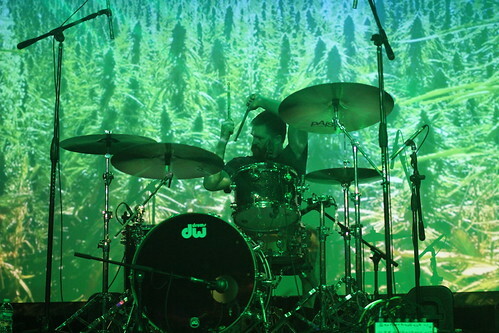 Immolation also played an intense set on Saturday, as they are typically known for. They may not do a lot on stage besides stand there and play their instruments but they do get people going with those crazy riffs. I thought I would see a lot more crowd surfers during Municipal Waste’s set. They were fun as always but I guess the fans were holding back because they went nuts for the night’s headliner. 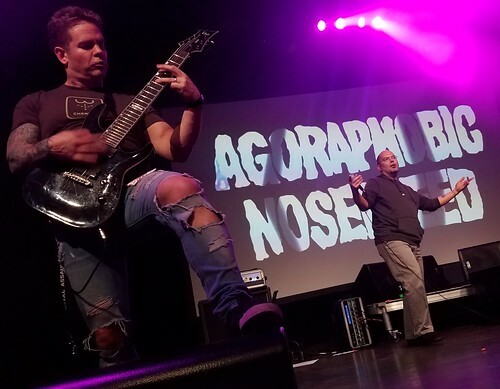 Agoraphobic Nosebleed headlined the first day with a great set. 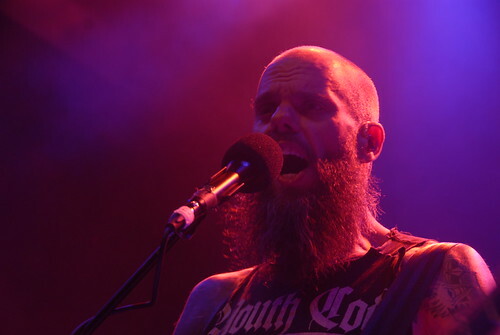 I wish Jay Randall had been there to perform with them, but the band still put on a great show and even played one of their sludgy songs from the Arc EP, “Not A Daughter.” As usual the Chicken Man was there leading the moshing and even got a shout out from ANb. On the second day my favorite performance was probably Khemmis. The Denver based doom metal band put out one hell of an album in Hunted last year and I had yet to see them perform live. 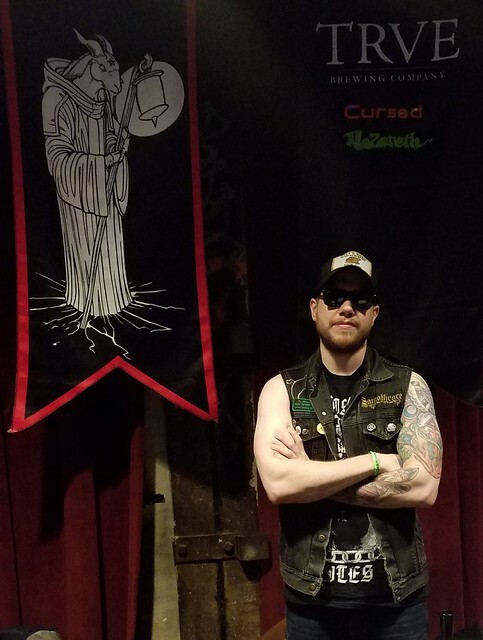 Their drummer, Zach Coleman, is also a brewer at the black metal themed Trve Brewing in Denver so their inclusion on the fest’s line up seemed like a no brainer. I had actually met Zach a few weeks before at my own metal show at Atlas Brew Works, and as fate would have it Trve’s booth was next to Atlas’s booth. Trve is best known for making excellent sour beers, though they only brought one sour to the fest, along with their Sleep inspired Nazareth IPA. 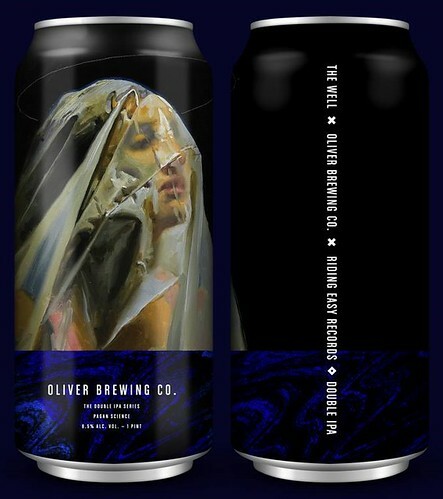 Trve’s beers are very hard to come by on the East Coast, so this was a great opportunity to get your hands on some. 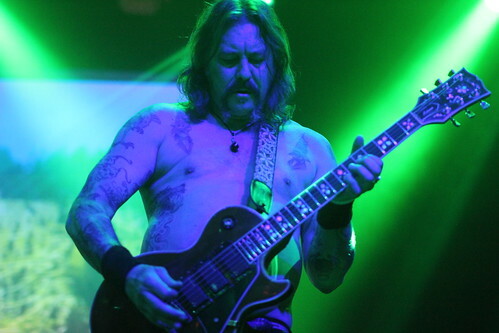 Stoner doom masters Sleep headlining day 2 of the Decibel Metal and Beer Fest. What a great finale to an awesome weekend of craft beer and heavy metal here in Philadelphia! In all the weekend was pretty great! Almost all the best metal related breweries were there, like Burial, Three Floyds, Trve, Holy Mountain and DC’s own Atlas. The only breweries I felt really should have been there but weren’t were Jester King from Austin and Oliver Ales from Baltimore. While Hammerheart’s Weltenwanderer rauschbier was my favorite beer of the weekend, there were other standouts as well such as Wigsplitter coffee stout from 3 Floyds, Ritualknife black braggot from Burial (a collab with Trve), Charred Walls Of The Damned Belgian quad cinnamon apple pie variant from Burnt Hickory, Twisted Doom New England style IPA from 18th Street and Cursed sour pale ale from Trve. I think the best brewery of the event has to go to Burnt Hickory from Kennesaw, Georgia. 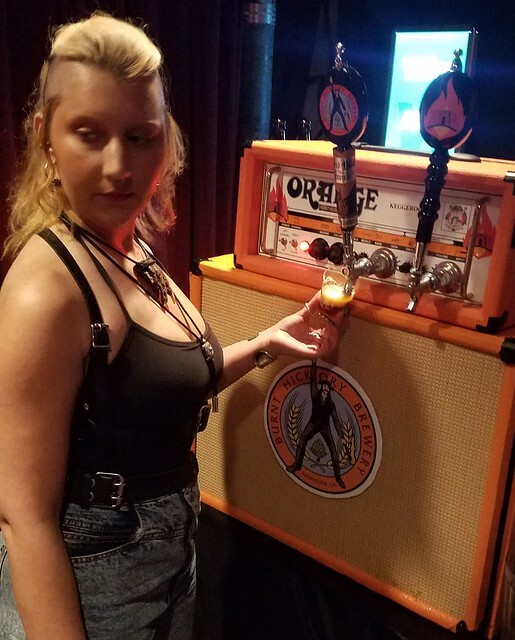 They were totally in the spirit with their Orange amp rig beer tap as well as bringing by far the most beers of any brewery to the event, including several rare variants of Charred Walls Of The Damned. I hope Decibel does this event again next year and I really hope more breweries get as into it as Burnt Hickory did! Thanks for reading to the end of my post. I had some help covering things in Philly from Metal Nick so be sure to check out more of his videos from this fest (and many, many other concerts) on his YouTube page here and more of his photos on his Flickr page here. Maryland Deathfest XV is just around the corner so stay tuned for our coverage leading up to our favorite local metal festival! 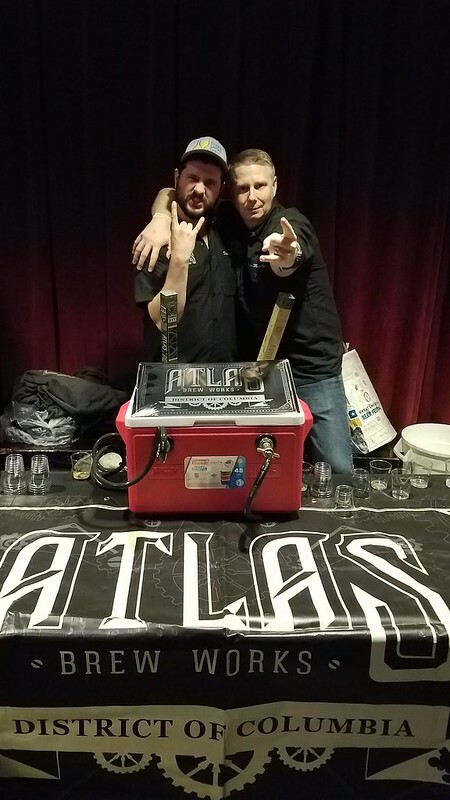 My buddy Brewer Will has gained employ at another brewery, now he’s working at Atlas Brew Works in Washington DC! We decided we’d take over Atlas on Friday, July 15th, for our next Metal Night event! Come hang out with other metal heads as we blast metal songs in the brewery all night, drink craft beer and, for one night at least, have a place to hang out with other metal heads outside of concerts. 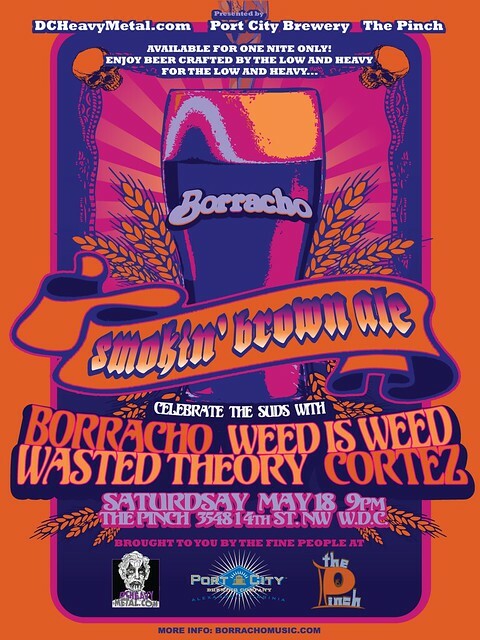 Local band Borracho will be on hand to debut their new full length album and Will has even brewed a special batch of the Borracho beer, Oculus Smoked Brown Ale, just for the occasion. In addition I’ll be giving away tickets to a ton of upcoming metal shows around the area (see the full list at the end of this post). There’s no cover charge and no purchase necessary, all you have to do to enter to win tickets is show up! The event is open to all ages but of course you must be 21 or over to drink. There will be coffee, soda, and water for non-drinkers and DDs as well. The brewery has plenty of free street parking along West Virginia Avenue and it’s less than two miles from both the NoMa/Gallaudet and Rhode Island Avenue metro stations on the red line. If you’ve got any questions or just want to know more then check out the Facebook event page we have created here. 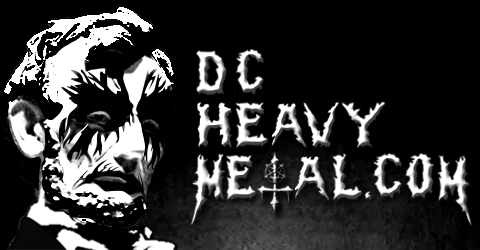 If you’ve ever been to one of our heavy metal nights at a brewery then you definitely know that we here at DC Heavy Metal love craft beer almost as much as we love metal! 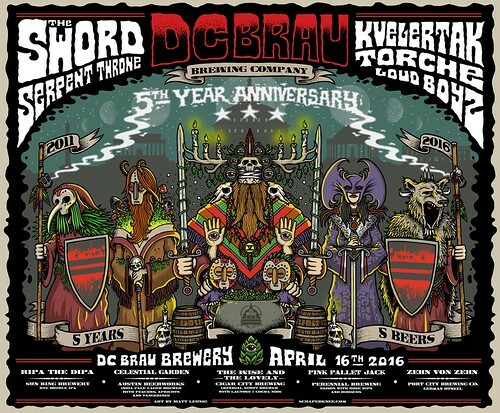 When DC Brau announced that their 5 year anniversary celebration was going to be an outdoor metal show we started counting down the days! On Saturday, April 16th the parking lot area at the brewery is going to be fenced off and a stage is going to be set up with a killer line up including The Sword, Kvelertak, Torche, Serpent Throne and locals Loud Boyz. 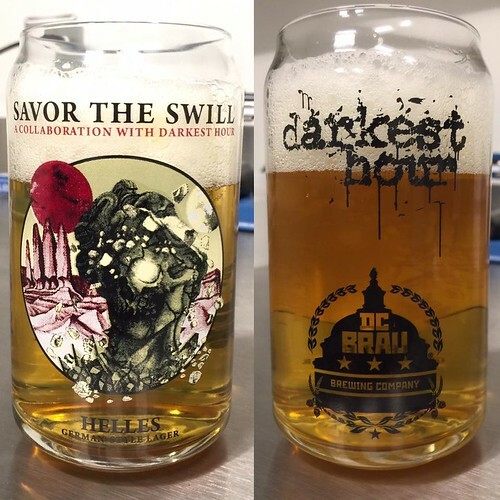 In addition, the brewmasters at DC Brau have teamed up with the brewers at 5 different breweries to make 5 special collaboration beers just for this anniversary show! We hope you are as excited about this line up of excellent bands and beers as we are and so we’re doing a special give away for this one. One of you lucky DCHM readers will get a pair of general admission tickets to this very event and another one of you with even better luck is going to be getting a pair of VIP tickets to the event (you must be 21 or older to win the VIP tickets)! To enter: just leave a comment on this post telling me which band you’re most excited to see at this show (if you don’t know any of them check out the videos at the bottom of this post). On Friday, March 25th at 5pm EST the contest will close and I’ll pick two winners at random (using Random.org) from all valid entries. The first winner will get the pair of general admission tickets and the second winner will get the pair of VIP tickets. If you are under 21 please specify so because I will not be giving the VIP tickets to a minor but you can still win the general admission tickets. Be sure to use a valid email you check regularly so I can contact you if you win. Don’t worry, I won’t add you to any spam lists or sell your info or anything sleazy like that. If I haven’t heard back from a selected winner in 24 hours another winner will be chosen at random. And what exactly do the tickets get you? The general admission tickets will get you into the event where you can watch all of the the bands perform, buy beer and food and generally have a great time. The VIP tickets include all of that as well as access inside the brewery for a VIP-only bar, catered barbecue, complimentary unlimited beer, and guaranteed access to all the collaboration brews. If you don’t want to wait to see if you win or the contest is already over when you read this then you can purchase tickets either at the 9:30 Club box office (to avoid fees) or online from Ticket Fly for $45 (GA) or $200 (VIP) here. Now, here’s a little bit more about the bands and those special collaboration beers. The Sword is a groovin’ doom metal band from Austin, Texas, and they’ll be headlining this show. Kvelertak is a high energy rock/metal band from Norway that incorporates elements of punk and black metal into a unique sound that is all their own and they’re known for their wild live shows. Torche is a band from Miami, Florida, and they call their heavy yet catchy music thunder pop which actually makes perfect sense when you hear them. Serpent Throne is an instrumental stoner band from Philadelphia and they’ve got a ton of sick riffs. 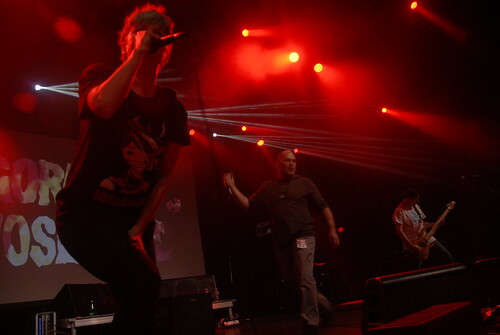 Loud Boyz are a local party rock band that formed from the ashes of the party thrash band Warchild. That’s a pretty sweet line up, but lets not forget those 5 exclusive collaboration beers. Cigar City in Tampa, Florida is known for making one of the best stouts in the world, Hunahpu Imperial Stout, so I’m pretty excited to see what kind of big stout they’ve cooked up with the DC Brau guys, a beer they’ve named The Wise And The Lovely. Alexandria brewery Port City‘s collaboration with DC Brau produced a dunkel, which is a German style dark lager (dunkel is the German word for dark) and while it won’t be a heavy as the aforementioned stout this beer, Zehn von Zehn, will surely be quite refreshing. They aren’t all dark beers though, for example the collaboration with Sun King in Indianapolis, Indiana is a double IPA brewed with rye and named Ripa the Dipa. The collaboration with Austin Beerworks in Austin, Texas is an India style lager (so expect it to be more hoppy than most lagers) named Celestial Garden. Last but not least the collaboration with St. Louis based Perennial Artisan Ales is a Belgian style saison with rose hips and hibiscus added to give Pink Pallet Jack a pink hue. OK I know I’ve been more wordy on this post than my contests usually are but there’s a lot of info for this event! If you’d like even more info you can check out the official Facebook event page for it here or go read DC Brau’s announcement post here. 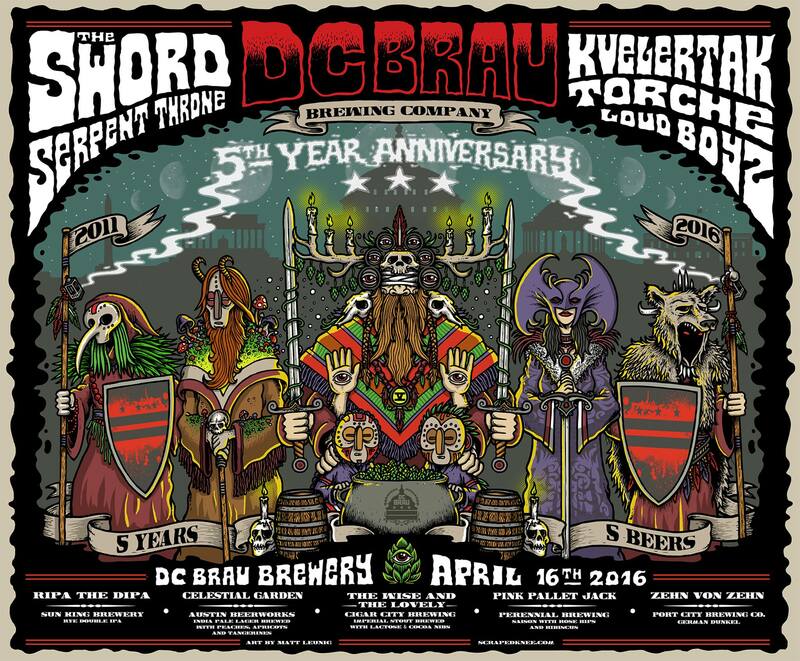 Now check out these videos below and tell me which band you’re most excited to see on April 16th at DC Brau’s 5th Anniversary Celebration! This Saturday, the 18th of May 2013, DC’s own stoner metal riff masters Borracho will be headlining a free concert at the Pinch in Columbia Heights! And this isn’t just any show, it’s also a beer release show! The awesome folks over at Port City Brewery, based in Alexandria, Virginia, have worked with the guys in Borracho to make the band their own signature beer! The Borracho Smokin’ Brown Ale is, as the name suggests, a smoked brown ale. The ale was made with an alcohol percentage of 6.66%, which is fitting for a metal band whose name translates from Spanish to mean a drunk or lush. The supply of this beer is extremely limited and won’t be sold in any stores. In fact it may be gone by the end of the night, so be sure to get out to this show if you want to try it. In addition to the beer being on draft at the show, there will also be lots of free prizes given out to people who attend. I’ll have a pair of tickets to see Kylesa at the Rock & Roll Hotel on June 19th up for grabs and there will be other prizes as well including merch from Borracho and Port City and also a growler (a 60 oz jug) full of the Borracho Smokin’ Brown Ale that one winner will get to take home! The growler is being provided by D’vines, an excellent beer/liquor/wine store also in Columbia Heights that even fills beer growlers on site. So here’s some details about the show. Doors open at 8pm and it’s all ages. Obviously you’ve gotta be 21 with an ID to drink. The venue is called The Pinch (address and map here) and it’s in Columbia Heights, which is a pretty nice neighborhood in Washington DC. There’s street parking but unlike some of the hotter areas in DC, like U St and H St, the parking is pretty ample even on a Saturday night and since it’s a good area you don’t have to worry about your car. The Pinch is also metro accessible, you can take the yellow or green line to the Columbia Heights stop and the venue is about half a mile north on 14th Street from the station’s exit (see it on a map here). The Pinch has a pretty normal bar/restaurant upstairs but the show will be taking place in the downstairs level since that’s where the stage is. The stairs down are right by the front door, you can’t miss them. There’s also another bar downstairs so you won’t have to keep going back and forth all night. There are going to be four stoner metal bands playing this free show and, in addition to Borracho headlining, there will be sets by Cortez from Boston, Wasted Theory from Delaware and the new project of Dave Sherman (of Earthride and Spirit Caravan fame) named Weed Is Weed from Maryland. You can check out any of those bands by clicking their names of course, and be sure to watch the awesome Borracho videos that I’ve embedded below. You can also get more info on the Facebook event page for this show here.